Can money make you happier? Does money make the world go round? That’s what some people say. In any case, money is important in our daily lives and so it is also a topic that may come up in the IELTS exam. Therefore, you should be ready to talk about it. Money could theoretically appear in any part of the IELTS exam. It is probably most common in the listening exam, where it often appears in section 1. In this case, you may hear someone talking about prices, and you should write down the correct answer – for example, £15. It is pretty simple, except sometimes the speaker may talk about things like annual fees, subscriptions, and discounts. These are all common concepts within the topic of money, and you should be aware of them. The new prices for annual membership are five hundred pounds for adults and three hundred pounds for children. There is a one-time set-up fee of fifty pounds, although this month were are running a promotion, so there is a discount of 30%. Money could come up in the reading exam in various ways. It could be the topic of a passage, or else it could be simply mentioned. For example, if you are reading a passage about the scale of Hollywood movies these days, they might have information about box office sales or payments to actors and actresses. Often you will have to scan a text to find the right number, and it will not be straightforward. You may simply be able to scan to find all the numbers in the text and then search for the correct answer, or else you may have to scan for an idea and then look for numbers around it. This is a key reading skill that you should practice often before an exam. Money often features in IELTS writing task 1 in a line graph, table, or pie chart. You might have to describe changes in price over time, or compare the prices of various goods. I have many articles on this website about describing trends and making comparisons, but you should also know how to write about money in general. The average price per kilo rose to $450 in 1997. The average price per kilo rose to 450$ in 1997. The reason for this is simply that it’s too easy to make a mistake. If you were to write pounds and cents, it would be incorrect. In the UK, we use pounds and pence. However, generally, in this part of the exam, you will use larger figures such as thousands, millions, and billions. Take the time to learn about these units as they become increasingly important in the twenty-first century. So what would you write? 3,400 million dollars? 3,400,000,000 is written as $3.4 billion. This is a common feature and I’ve seen countless students make the above mistake. The most important thing about a job is how much money you earn. To what extent do you agree or disagree? In this case, you wouldn’t need much specialist vocabulary. Instead, you could use quite basic money-related words and phrases, which we’ll cover in the next section. Money could well appear in any of the three parts of the speaking exam. In part one, you may be asked about shopping or spending habits. Then, in part two, you may have to describe a major purchase or something valuable. In part three, the questions will be more difficult and may be similar to those mentioned for the writing task 2 above: money and happiness, etc. It is unlikely that you would need to be able to talk about prices in depth, but a good grasp of numbers if important whether you’re learning English for travel, work, or study. Saving money happens slowly over time. Q: Are you good at saving money? A: No, I’m hopeless at saving money. As soon as I get my paycheque, I go out and spend it. I hope that in future I can save and invest wisely, but right now I’m more likely to borrow from my friends just to make ends meet. After a cheque is deposited in the bank, it can take several days for the money to clear. Once it has been successfully added to your account, you can then withdraw the cash, if you like. 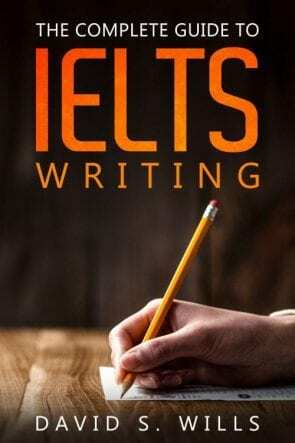 I will write a sample answer for an IELTS writing task 1 question that relates to money and spending. The line graph shows how much money is spent on books in four different European countries over a ten year period. In each of the countries, people spent more on books in 2005 than 1995. German people spent the most money on books over the entire period, ranging from $80 million to about $95 million. The total spent increased through the late nineties before declining at the beginning of the new millennium. It finally rose to a new high by the end of the period. France showed a similar trend, although instead of falling, the amount of money stalled between 2001 and 2003, before growing to a final high of about $75 million in 2005. Italy began the documented period as the third highest spender on reading material, but ended up spending the least after Austria overtook them between 2003 and 2005. Italy’s total fluctuated between fifty and sixty million dollars, and then ended the period a little higher. Austria, on the other hand, grew sharply except for a brief period of stagnation from 1999-2001, and finished at a little over $70 million. Beg, borrow, and steal – meaning to be desperate for money. Not literally doing these things. Example: I really wanted to get those tickets, and I did. I had to beg, borrow, and steal, but I managed it! Make ends meet – to be able to pay your bills and cover basic expenses. “I’m really struggling to make ends meet these days with so many new expenses. Money doesn’t grow on trees – it is not easy to get money and it shouldn’t be wasted. Example: Don’t leave the lights on all day. I have to pay the bills, you know, and money doesn’t just grow on trees. Made of money – to be very rich. Example: I can’t afford to buy you a new dress. I’m not made of money! Money to burn – meaning an excess of money or a willingness to spend money that you have. Example: I can’t wait for the weekend. I’m gonna go shopping because I have money to burn. Burning a hole in [your] pocket – to have money and feel a need to spend it. Example: My sister always spends her allowance quickly. It just burns a hole in her pocket. Throw money at – to give money carelessly or use money wildly to solve a problem. Example: Once he made his first billion, he just threw money at every problem he faced. Hi David, I’m following your blog from last few weeks and it is really helping me out with my IELTS preparation. That’s great! I hope you have found my website useful. If you have any questions, let me know. Hi David! I”m from Vietnam, a country might far from what you know. All I have to say is that “” thank you so much, David”” I”ve been follow many different pages but I can say that yours is the best. Once again thank you so much. I almost wrote down every of your single word and i”ve practiced them again and again until I …learn by heart ( things that you have not recommended ). Thanks so much for your kind words. I’m really glad to hear that my website was useful for you. It truly is a pleasure to hear back from IELTS learners like you. I hope that you can get a high band score that rewards your hard work.